Photos come courtesy of Timeless Dimension and Amiami. Hot Toys has fully revealed their new Captain Harlock 1/6 Scale Collectible Figure with Throne of Arcadia. This Captain Harlock figure is based on the new, and impressive looking, Space Pirate Captain Harlock CG film hitting Japanese theaters. 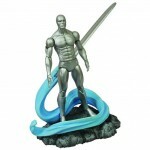 The figure comes with the Throne of Arcadia, his sword, a pistol, multiple sets of hands and Mr. Bird. It’s expected to be released in August of next year. Also available is a standard Captain Harlock 1/6 Scale Figure sans throne. It comes with all of the other accessories listed above. If you don’t have the space for the massive throne accessory, then this is the version for you. Read on to see the new photos. Space Pirate Captain Harlock is being reimagined in an all new CGI feature length film in Japan. It hits Japanese theaters this month. 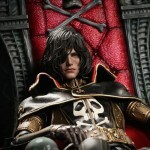 To celebrate the films release, Hot Toys has announced they will be producing a figure based on Captain Harlock. They have only released a teaser image, but expect more images and info soon. Read on to check out the image as well as the trailer for the film. Big Bad Toy Store has sent along a bunch of new listings. Among them are a Marvel Select Silver Surfer, Princes Leia In Boushh Disguise Maquette, new Bust Banks, Superman ArtFX Statue and more. Check them out below, and read on to see some new images. A few more pre-orders have been added. Square Enix has released a handful of images for their upcoming Captain Harlock and Yuki Hotaru Play Arts Kai Figures. We also have the release a price! The figures are due out in November. they will have an MSRP of 8,800 Yen (about $91 USD), though prices at retailers will likely be different (hopefully cheaper). Read on to see the new images. 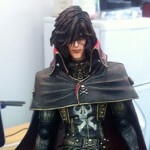 Last month we shared with our readers a sneak peek at the Play Arts Kai Captain Harlock Figure. Now, Square Enix has revealed new images for, not only, Space Pirate Captain Harlock, but also a Yuki Hotaru Play Arts Kai Figures. Currently, the release date and price haven’t been revealed. We will keep everyone updated as that info is posted. for now, check out a few pics of both figures by reading on. Later this year, a very impressive looking CG animated Space Pirate Captain Harlock film is getting released by Toei Animation. 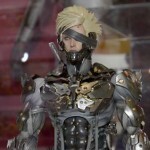 Now, courtesy of the Cybergundam Blog, we have photos of two upcoming Play Arts Kai Figures based on the movie. Shown is Captain Harlock himself as well as Kei Yuuki. Read on to check out the pics, as well as the trailer for the film. All times are GMT -4. The time now is 4:24 PM.